When European explorers were first learning about orchids, they created a genus of "Epidendrum orchids" that included all epiphytic orchids — those that grow on trees. The Epidendrum genus still contains over 1000 species, but now has a much clearer taxonomic definition, with its species now sharing a common ancestry sometime in the distant past. (They are no longer all epiphytic.) Epidendrum falls within subtribe Laeliinae, which makes them relatives of the better-known Cattleya orchid genus. They are often hybridized with other members of the Cattleya alliance. Distributed under the Creative Commons Attribution 2.0 Generic license. Typical Epidendrums have long, canelike pseudobulbs with alternating leaves all along their length. A flower stem emerges from the top of each pseudobulb, typically producing a roughly hemispherical cluster of flowers. The flower stem usually lasts a lot longer than the individual flowers do: old flowers drop off as new ones open. 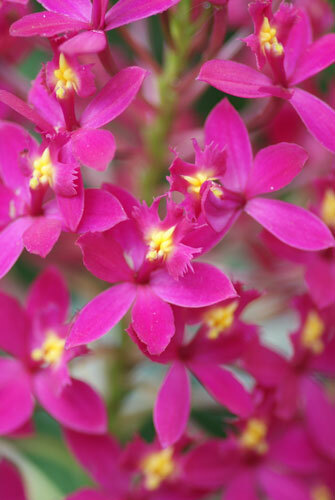 Common colors include red, yellow, purple, and white orchid flowers. They readily form keikis, which makes propagation easy. You can actually take an old cane and cut it into pieces with one or two nodes each, and set them on moist sphagnum moss. In time, many of them will grow. Most Epidendrums like bright light; direct sunlight may be appropriate. Of course, for such a large genus there is variation between species in everything I'll say about growing them; research your particular species, or experiment to see what it likes. Not enough light is the most common reason for them not to bloom. Water as they approach dryness. They're pretty forgiving if you let them dry out, so don't worry about that. Do not overwater, though; most won't appreciate it. I usually use an orchid potting mix based on fine-grade fir bark. Since many of the plants get tall and topheavy, using clay orchid pots can help keep them stable. Most like intermediate temperatures, in the lower 70's Fahrenheit (21-25C) by day, with a 10-15°F drop at night (6-8C). This varies widely, though, so research your particular plant. Most Epidendrums tolerate cold as long as they don't freeze.